I almost forgot to review this book. Not because it wasn't good. Not because I didn't like it. I just simply forgot to put it on my Goodreads... And when you go months with just reading and not reviewing, well, you need to rely on your Goodreads to help you remember what you've read! From the gap in my log I am guessing that I read this in November. I am also guessing that it was an e-book since I seem to be reading a lot of e-books lately. I'm pretty sure I forgot to list it because I read it so quickly. Anyway, I enjoyed Adi Alsaid's first book, Let's Get Lost, when I reviewed it for VOYA. I enjoyed this one too. 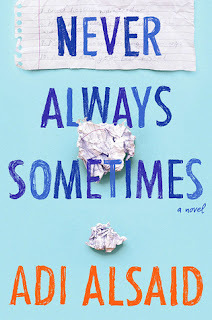 Told in alternating chapters, Never Sometimes Always tells the story of best friends Dave and Julia who have decided in their senior year to do all the cliche things they promised they wouldn't. The only problem is that Dave is already doing one of the biggest things--falling in secret love with his best friend. He's pined for her since he met her but was always safely in the friend zone. Crossing things off the cliche list is presenting him with new opportunities--but sometimes you need to be careful what you wish for. This was a really quick read for me. I liked Dave and I liked Julia (as oblivious as she was) and even though I have no official record of reading this, it has stayed with me. I remember staying up late into the night to finish. I'd recommend it to older YA readers (this is not a tween book) and look forward to Alsaid's future stories.